The second episode of Agent Carter proves that the quality of the first wasn’t a fluke and continues to build on the strong setup. I really like the dynamic that is being developed between Peggy and Jarvis. His droll wit is a great match for her standoffish nature and their partnership is turning out to be a lot of fun to watch. He seems to already have a real sense of the sort of person Peggy is as he fully expects things to escalate very quickly when on missions with her. There was another great scene where Jarvis advises Peggy that she needs to open up a little instead of acting so distant all the time. He tells her that Howard mentioned that Captain America heavily relied on her. This conversation has so much weight as it shows the admiration that Howard, Jarvis and Steve have for Peggy. All in pretty much a single line too, really fantastic stuff. Jarvis is clearly very brave and willing to get involved in the action. His blind shooting of his gun might not have been the best approach but I like the fact that he’s willing to much in if the occasion calls for it. I was a little concerned that he might take on the role of the “damsel” in distress. Peggy was given some really great character beats here as well. Her intelligence was reinforced through her knowledge of Vita Rays and how they work which again puts her one step ahead of her colleagues who are constantly underestimating her. I like her subtle barely restrained contempt whenever she’s told to do the menial tasks when she knows that she’s capable of so much more. She does manage to hide it and creates a really interesting secret identity story as she works to keep what she’s doing hidden from those around her. Some tension is created when there are photos that could potentially out her and the final scene revelation of a license plate that could also incriminate her. 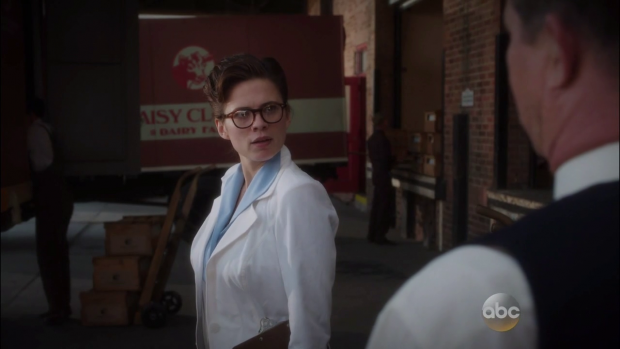 Her Milk Inspector disguise was a fantastic scene that really shows Atwell’s versatility. She becomes almost unrecognisable in her fast talking disguise that causes everyone around her to be more than a little scared of what she might do. She crafts another persona to her future landlady as she plays the kind of woman who would get to live in that apartment. It’s clear that it makes Peggy feel sick to act like that but she understands that it’s necessary to get what she wants. My favourite moment of the episode was when she was fighting with the backdrop of The Captain America Adventure Hour (sponsored by Roxxon Oil). The contrast between the real violence and the manufactured radio violence made this action sequence far more memorable and clearly showed the difference between glamorous superhero fiction and reality. It’s a nice reminder that Peggy’s world has some realism to it. The Captain America Adventure Hour was used really well throughout the episode. It kept popping up as the episode progressed and making Peggy more angry each time it did. It’s very typical of the entertainment of the era with the exaggerated hero, evil villains and brainless damsel who does nothing but get captured and act as a prize for the hero. It’s really clever to have something like this in a universe where Captain America was a real person and have Peggy be constantly reminded of the man she loved through something she finds personally insulting. Peggy is characterised as the helpless damsel in this and Captain America sounds cheesy with every line uttered. It’s easy to accept that this wouldn’t be easy to hear for her given that she lived the adventures they are making a mockery of. Obviously it’s just a bit of silly fun to most but to her it insults the memory of the man she lost. This adds more vulnerability to the character as she is clearly a woman grieving while trying to get on with her life. Thompson and Dooley are fleshed out a little more in this episode with their particular roles when it comes to interrogations. Dooley is the good cop who literally offers the carrot and Thompson handles the stick. It’s nothing new but done quite well here. It’s great to see Chad Michael Murray play a suave sexist charmer one minute and a rough bruiser the next. Daniel Sousa gets a nice scene where he opens up a bit to Peggy. I wonder if he’s the husband she refers to in Captain America: The Winter Soldier. Lyndsy Fonseca’s Angie seems to be a really fun character so far. She really nails her accent and has some great lines with snap one sentence judgement of her neighbours. There’s clearly some intelligence to her character so I suspect Peggy won’t be able to hide her true identity from her for long. The villain story is really starting to grow arms and legs which I like. Leviathan is identified as an organisiation and there’s the start of some kind of understanding of their plans. It’s building quite nicely and doesn’t seem to be posturing so there’s some good time economy going on here. It’s essential for such a short run so hopefully this will continue. Some of the attempts at humour didn’t quite work for me here. The scene where Peggy wants to get a hold of some incriminating photos so crawls along the floor and is almost caught hiding under a desk was just a little too awkward slapstick for me. It kind of goes against her skills that have been well established and there’s plenty of intelligent humour in how she and Jarvis play off each other so this feels pretty extraneous. Agent Carter builds on the strong elements established in the first episode and forges on. The villain story is building momentum nicely which is good given that this series will only be 8 episodes long. It needs to tell the story quickly and concisely. So far that doesn’t seem to be a problem. 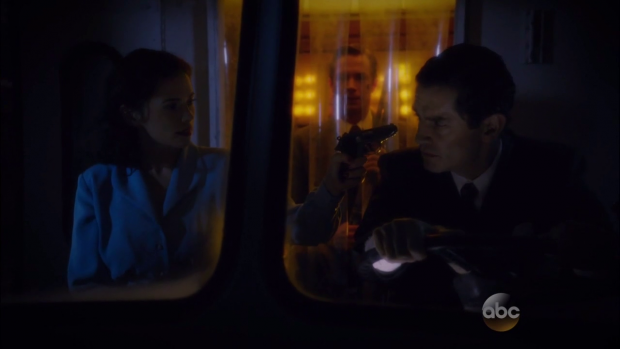 Jarvis and Peggy’s partner relationship continues to be fascinating viewing. Jarvis’ droll wit is a good match for her and he’s clearly very keen with his observations. This relationship has already become the core of the series. The use of The Captain America Adventure Hour to contrast fiction with reality is a great touch. Peggy’s reaction to hearing her life dramatised so incorrectly is great to see and it’s obvious that she feels it disrespects the memory of Captain America. It brings more vulnerability to the character as well which only adds further depth to her. Some of the comedy is a little awkward like the slapstick hiding under the desk sequence that was just unnecessary. It undermined Peggy’s skills slightly and wasn’t needed given the strong humour in her interactions with Jarvis.